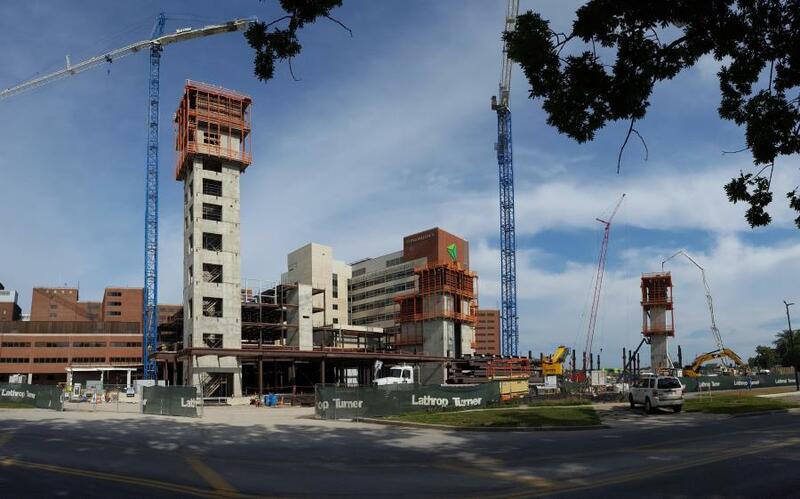 Lathrop Turner is building a $385 million, 13-story, L-shaped 302-bed patient care tower — Generations of Care Tower — on the campus of ProMedica Toledo Hospital. 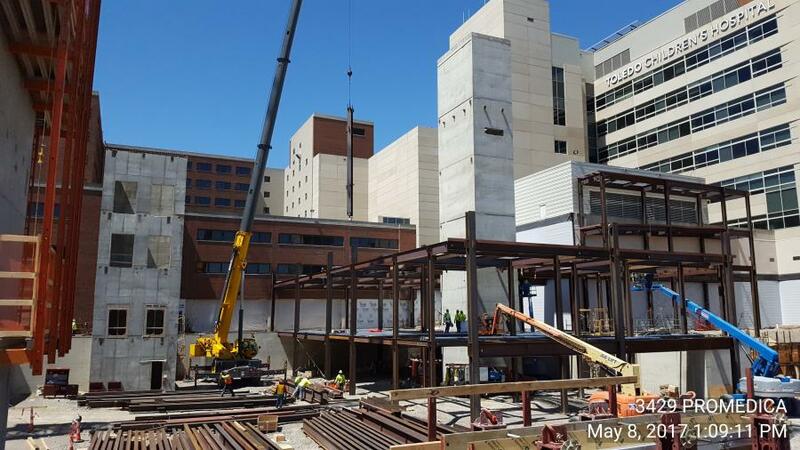 In addition, the Toledo Children's Hospital, a project that broke ground on April 4, 2016 and will be completed in July 2019, with occupation expected by the end of the year. The tower was designed by the HKS Inc., an architectural firm based in Dallas, Texas. The new tower will eventually replace an 86-year-old Legacy Tower, and is expected to create nearly 1,000 construction jobs. According to ProMedica, the new patient care tower will feature larger, all private patient rooms innovatively designed to increase caregiver access and time with patients; user-friendly technology to help patients stay informed about their diagnosis and care plan as well as improve patient safety; and care collaboration spaces that allow doctors, nurses and clinical staff to discuss patient care plans. It also will have additional intensive care unit beds to care for patients with complex medical needs. Its design incorporates environmentally-friendly building principles such as glass curtain walls for plentiful natural light, energy conserving mechanical, electrical and plumbing systems and long-lasting terra-cotta masonry panels. 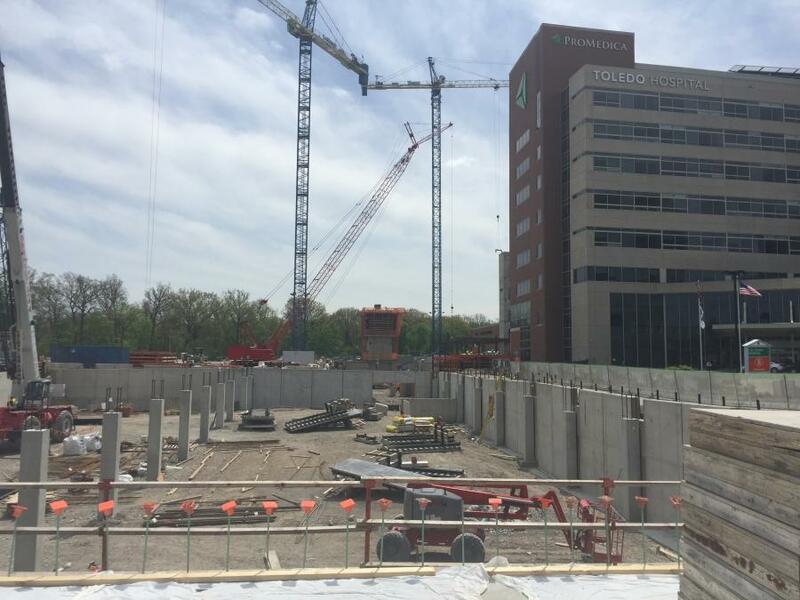 Arturo Polizzi, metro region acute care president of ProMedica, said the replacement tower is the most significant project in ProMedica's history and represents the organization's commitment to caring for future generations in northwest Ohio. During the planning process, ProMedica leaders visited numerous hospitals for design and functionality inspiration. These facilities included the Cleveland Clinic, The Ohio State University Wexner Medical Center and St. Joseph Mercy Oakland. The tower, which has lower level with a kitchen, cafeteria, and other support services, will have several floors of shell space for future growth. It is connected to a one-level underground garage. While work on the tower began in the spring of 2016, site prep work started in January with the demolition of several houses and the relocation of roads and utilities. Demolishing the homes went smoothly and part of the relocated ProMedica Parkway was placed above their foundations. “This provided the room for the new tower,” said Zander. “The campus is expanding to the east and the main thoroughfare needed to be relocated to the east to allow for the expansion. The construction is standard, but it's pretty intense. We've got the one particular discipline — the structural concrete. We have seven concrete cores (shafts) of varying sizes and complexity that are all going in concurrently, which is a challenge for the schedule, manpower, and just keeping things going. The project requires serious coordination with all the subcontractors. “We brought in several design assist contractors earlier on in the design process,” said Zander. “Their thoughts made their way into the design documents while they were being prepared, which was important for the exterior skin, structure, and MEP systems. We were brought in 2015 to start planning and collaborating with the architect for logistics, scheduling, and budgeting. This means reducing noise levels, minimizing dust and other construction impacts. Lathrop Turner is prefabricating the overhead mechanical systems that run down each corridor of the tower. This is being done off site in a rented warehouse. The work site is busy with about 24 Lathrop-Turner staff and close to 230 tradespeople. Zander is depending on key staff support such as Bill Kidd, Lathrop-Turner's project manager and Joe Zunk, the firm's senior superintendent. “Joe is the field general and he manages all the subcontractors' schedules, manpower, deliveries, and field operations — the buck stops with him,” said Zander, “and Bill not only oversees what Joe is doing, but the engineering side of the project as far as contracts, change orders, and documents from the architect. The work space is tight. The subcontractors include Schuff Steel, Kansas City, Kan., for structural steel; Granger Construction, Lansing, Mich., for structural concrete; Spence Brothers Construction, Saginaw, Mich., for the parking garage; Dunbar/Limbach for HVAC and plumbing; Laibe/Romanoff, Toledo, Ohio, for electrical and technology; and OCP, Toledo, Ohio, for interior framing, drywall and ceilings. “We are at a 93 percent recycle rate with our trash and debris from the project,” said Zander. Prior to this project, Zander was working on a large healthcare project in Columbus, Ohio. Lathrop Turner is responsible for the tower cranes — Terex power cranes, a 405 and 415, which are being rented from Maxim Crane out of Newport, Ky. It also is bringing in two double-hoists to help remove the debris, which are being rented from Capital City in Columbus, Ohio. Each Maxim crane has an operator and oiler responsible for incidental maintenance, with Maxim responsible for major repairs. Spence Brothers Construction, a major subcontractor, is responsible for building the concrete parking deck/ramp, a roughly $8 million contract. At peak times, Spence Brothers had just over 45 people on site, including those from its subcontractors — Foundation Steel who provided and installed all reinforcing steel, Fast Decks who provided and installed formwork for the elevated deck and Eagle Excavation who provided all earthwork services. Spence Brothers has rented two cranes from Capital City in Toledo — a Manitowoc 200 ton crane and a Link-Belt 75 ton crane. Additional, smaller equipment was rented, which included forklifts, manlifts and light towers. All major equipment is being serviced and operated by Capital City. One issue that Spence Brothers, as well as the other subcontractors on the project are dealing with, is a shortage of manpower. Dave Spence noted that age attrition and the widening skills gap continues to be a growing concerning in the construction industry across the nation and poses problems for contractors in acquiring the necessary manpower to complete large-scale projects such as this one. Schuff Steel's sub erector, Henry Gurtzweiler Inc., is installing the structural steel and metal decking for the tower. Henry Gurtzweiler has approximately 40 employees on site. Schuff is using a variety of equipment: a Terex SK405 tower crane, a Terex SK415 tower crane and a Grove RT890E hydraulic crane; a Genie S-85 and a JLG 860SJ boom lift; and a Genie GTH 1056 reach forklift. Henry Gurtzweiler is renting equipment from NES, located in Toledo.